Welcome to the Professional Leather Cleaners Association! We want to be your trusted source of information for the care and cleaning of your valuable leather apparel and accessories. 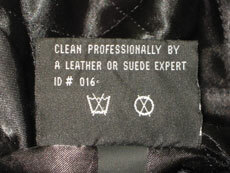 Perhaps you've seen the care label in your leather garment. But just what does that mean? It means that only a Professional Leather Cleaner is equipped and properly trained to clean leathers, suedes and furs. Reputable dry cleaners outsource their leather care services in order to get the best cleaning, ensure happy customers and avoid costly damage. Your local cleaner likely already uses or has access to a member of PLCA. Would you like to contact one of our professional leather cleaners? Visit our contact us page to see our list of cleaners sorted by their locations. If you are not sure who to contact, you can submit your questions through our website, and we will have a PLCA member contact you. Find out how to choose a Professional Leather Cleaner, what you should expect when your leather apparel or accessory is cleaned, and what things you should avoid.